Apart from providing an accurate and reliable body fat percentage, the Omron Body Fat Loss Monitor also helps you to monitor your Body Mass Index in order to improve your overall health and fitness. It’s often recommended by dieticians that, in addition to regular weighing to monitor your fitness levels, you should also monitor your fat percentage in order to reduce the risk of developing serious health problems in the future. This monitor can store the profile settings of about 9 individuals, which means that all of your family members can check the results provided by this device to plan their ﻿exercise and dietary schedules for a healthy living. The scale’s two modes, standard and athlete, are provided so that each user can access exact results based on the level of his or her exercise regimen. This fat loss monitor also comes with a choice between the US and metric systems when it displays results. It’s scientifically proven that a person with high body fat levels tends to be more prone to cardiovascular diseases, as well as other problems related with the endocrine system, such as diabetes. 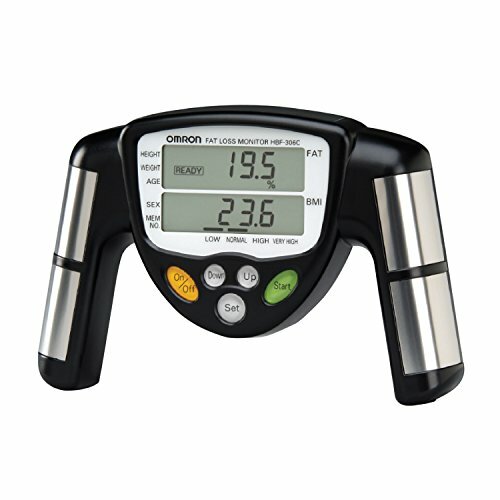 By using the body composition analyzer provided in the Omron Body Fat Loss Monitor, you can monitor your body fat levels to ensure that you are losing unnecessary fat, rather than important muscle mass of your body. This monitor uses a Bioelectric Impedance Analysis which involves sending a low-level, safe electrical signal through you body which measures the resistance faced by the signal while it travels through fat. The Omron Body Fat Loss Monitor is perfect for both adults and children as it’s calibrated to provide and store data of nine users of any age group. Its unique guest mode feature allows others to use this machine without losing or mixing the data of the other nine permanent users. This monitor is designed as a handheld and portable device. It comes with an oversized, light, dual-section LCD display screen for ease of reading. Before using this scale, you’re required to feed your gender, age, height and weight into its memory, then select your profile number, confirm your personal data, grip the handles of this monitor in your hands and this machine will automatically provide all the readings. Each reading is then analyzed according to the personal information provided by the user and a comprehensive result is provided. You can buy it for about $33. The Omron Body Fat Loss Monitor provides reliable results and helps you to monitor your body fat percentage and BMI in order to improve your overall health and fitness. This monitor can store up to 9 individual profile settings, which mean that it can be used by your whole family to plan their exercises and dietary schedules. Its two modes, standard and athlete, are provided so that you can access accurate results based on the level of your exercise regimen. The Omron Body Fat Loss Monitor provides instant results; it takes about seven to eight seconds to get daily readings of your body fat percentage and BMI by using this monitor in the privacy of your home. If you’re looking for a body fat loss monitor and BMI calculating device then you can compare the Omron Body Fat Loss Monitor with the Escali BFBW200 Glass Body Fat/ Body Water Digital Bathroom Scale and the Tanita BF679W Duo Scale, as both of these products also provide body fat, body water, muscle mass and bone mass readings. If you’re looking for a digital handheld, portable, body fat loss monitor that provides body fat and BMI readings then the Omron Body Fat Loss Monitor is the best choice. This monitor can store up to 9 individual profile settings with two modes, standard and athlete, the manipulate results depending on your levels of activity. The Escali BFBW200 Glass Body Fat/ Body Water Digital Bathroom Scale also provides readings of your accurate weight, body fat percentage, body water and placement within a healthy range. This three button scale gives a high-tech analysis of the fitness level of each individual and can be used by almost 10 users and comes with a weighing capacity of up to 440 pounds. The Tanita BF679W Duo Scale provides reliable weight results and also helps to monitor your body fat and body water percentage in order to improve your overall health and fitness, too. The other significant feature of this weighing scale is daily calorie intake function that gives out the amount of calories you should consume within twenty four hours in order to maintain your current weight level. Apart from regular weighing to monitor your fitness levels, this machine also helps in monitoring your body water and fat percentage. After comparing all the features related with the three fat loss monitors mentioned above, the Omron Body Fat Loss Monitor is the best choice because of its small and portable design and its ability to provide both body fat percentage and BMI data for nine users. The Tanita BF679W Duo Scale comes in second place because of its extra feature of calorie intake that gives you the amount of calories you should consume within twenty four hours to preserve your current weight. The third best option is the Escali BFBW200 Glass Body Fat/ Body Water Digital Bathroom Scale, as it provides most of the readings of the other two scales, but doesn’t calculate the BMI data of the user. It’s also comparatively high-priced compared to the Omron Body Fat Loss Monitor. Withings WS-50 Smart Body Analyzer How to Measure Body Fat: A List of Your Options and Their Levels of Accuracy The Best Smart Scale Review What is a Body Fat Scale?